Within the first five minutes of the direct-to-video spy thriller Extraction, a stubbly Bruce Willis pulls a gun on an enemy, states "Don't ever threaten my family again" ... and then proceeds to fatally shoot this person. It's a relatively minor and early detail in the grand action-movie scheme of things, but it does raise a red flag over what's to come, about the kind of dialogue it'll offer and how coherent the following events might be. This proves to be an accurate indication, unfortunately, as Extraction unleashes a tiresome display of questionable dialogue, nonsensical circumstances, and wooden performances wrapped up in a dull, jerky progression of action scenes that make the pacing painful to bear. And much like his turns in The Prince and Vice, Bruce Willis ends up being a non-factor in his supporting role by cuffing him up and keeping him quiet for most of the film's time on screen, robbing Extraction of most of that meager potential in the action department. Willis does get caught up in some deadly fisticuffs at the beginning, in an hairy situation that takes place ten years before the core events in Extraction, ones that led to an attack on Leonard Turner's family as a retaliatory threat over his work in the CIA. Over the course of the following decade, Turner's son, Harry (Kellan Lutz), has been training to become a government operative himself, both to follow in his father's footsteps and to prevent events like those that happened to his family when he was a child. His efforts haven't been rewarding as of yet, resulting in several rejections despite his clear hand-to-hand and firearms skill, relegating him to desk/research work. Along with the rest of the agency, Harry Turner soon learns some troubling information: that his father has been taken hostage by terrorist forces. In the midst of the departmental discussions and assignments of field agents, including Gina Carano's Victoria, Harry attempts to cut through the red tape and take charge of his doomed father's rescue. Amid brash contrast, jerky editing, and establishing shots of locations with accompanying descriptive text, director Steven C. Miller seems like he's paying homage to Tony Scott with the bold, hyper-caffeinated style going on in Extraction, only without the powerhouse charisma of a Denzel Washington also filling the screen. Instead, we're first treated to a prolonged training montage displaying the physical acumen of The Twilight Saga's Kellan Lutz as Henry Turner, gearing up for another field-agent tryout by crashing through firing ranges, rounds of boxing, and lots and lots of strength building ... without much of any insight into who this guy really is. Brief appearances from Willis and D.B. 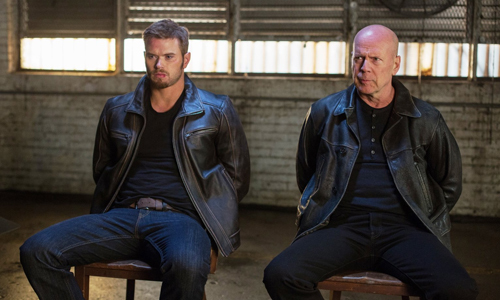 Sweeney as his mentor do their damndest to give Henry a bit of hurried depth with their credible responses to his career pursuits, but Kellan Lutz's acting chops aren't robust enough to embody the overused antihero characteristics that might stand on their own in a routine spy flick. He's serviceable in a way that escorts his character between bursts of action, and that's about it. Problem is, Extraction doesn't deliver enough action to make one forgive those points in between. Sure, there are a handful of brisk hand-to-hand brawls, knife fights, and car chases scattered throughout Henry Turner's search for information about his father -- and his hunt for the Condor, another in a line of menacing plot devices pursued by spy-thriller heroes -- but director Miller also strives to maintain the pretense of an engaging suspenseful narrative along the way. That includes rekindling an abandoned relationship with Veronica, uncomfortably played by Gina Carano, and focusing on the clunky moving parts of the CIA's decision-making around a high-profile hostage and a rogue employee. Despite the presence of a fierce ex-MMA female fighter and a strong conflict of interest involving the capable means of the government, the number of hard-hitting action sequences remains rather sparse, and the ones that do appear are edited together so harshly and quickly that they're unsatisfying on a visceral level. Look, Extraction doesn't need to be smart, as it could effortlessly mimic the likes of the Bourne series, Tony Scott's own Spy Game, or even the Gina Carano vehicle Haywire, so long as it delivered enough coherence and vigorous action to pass the time. That said, from the groan-worthy dialogue to the trite developments that make up its threadbare story -- the rationale behind why Harry hasn't been accepted into the CIA; trusting an old flame of Harry's to work against him -- there's a ton of intolerable disbelief dragging down the plotting as it attempts to charismatically push forward. Alas, that also crashes over into the action itself, full of far-fetched driving skills, dubious gunfights, and dopey maneuvers by Henry's varied antagonists. It's difficult yet doable to get beyond those first wonky minutes of Extraction with Bruce Willis in the driver seat, but the dull, head-scratcher renegade pursuits of CIA reject Harry constantly make one want to extract themselves from the viewing experience instead of roll with the punches.